A totally new business concept brought to life by three fellows, a small terrier, a very large cat, and their loyal employee, a guy named Richard. They work tirelessly together to create unique, handcrafted Interior Art Homes, timeless works of art that provide a lifetime of comfort and security indoors. Richard Miklenic founded Scottie’s Fine Art Caves Inc., which designs and builds Interior Art Homes for companion animals. Richard began with Canine Fine Art Caves for dogs as our main product. See Scottie’s Story - a true account of how Richards dog inspired the creation of the very first Canine Fine Art Cave and has been a valued member of the company ever since. Most recently we have introduced a second product line known as Feline Fine Art Mountains. Inspired by our latest addition to the company, iMac the cat made it very clear to us that we either accept this second product line or else. All of our Interior Art Homes are functional pieces of artwork designed for your companion’s comfort and privacy. All are made out of rock hard paper mache, with hand selected, naturally formed wood salvaged from the wilds of Vancouver Island. Our homes are timeless pieces meant for the life of your companion, lovingly handcrafted in our home/studio on the west coast of Vancouver Island. All homes are continually examined and tested by Scottie and iMac, Richard’s animal family, during production. Cannery Bay Cave- The arch for this piece was salvaged from a wind fallen, ancient, yellow cedar near the bay. Most of its original pigment has been leached out to give it a bone-like appearance. An ancient sun-bleached bone designed to commemorate the purity of the untouched forest around Cannery Bay and beyond. This beautiful cave is ideal for medium or large dogs and has a hand painted interior and a beautiful coastal white stone finish! Browning Passage Cave- The fine art cave, Browning Passage, was made for the critter who prefers privacy! Once through the grand cathedral-like entry of the root, turning right, the owner immediately enters the spacious, cushion cavern where they can either curl up or stretch out in complete privacy. If preferred, a perimeter-sized cushion can be created to utilize the entire floor area. Flexibility abounds! For those companions concerned about home security, and who wish to keep watch at all times, their cushion can be positioned closer to the entrance. This cave is ideal for small dogs and has a soft brown stone finish. 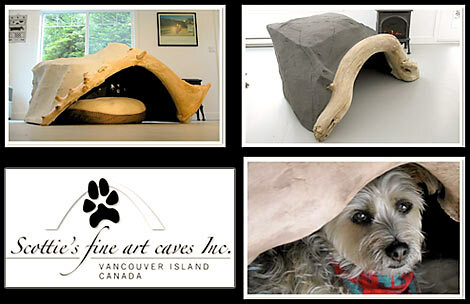 Can You Customize Your Canine Fine Art Caves? Absolutely! At SFAC, creating an ideal Canine Fine Art Cave begins with knowing all about its true owner to be. The more we know, the better we can develop a paw in glove fit. Factors such as breed, age, size, coloring, personality and preferences are closely considered in the design process. Our cave interiors are designed to meet any dog’s needs for supreme comfort, however, we do not stop there. We are also greatly interested in where the cave will be placed, space availability, and the existing decor of the room. The exterior of each cave is crafted in a way that will allow it to retain its visual appeal within the context of the greater home for years to come. Just as every dog is unique, so is each and every canine cave that we build. We can build practically anything imaginable, regarding, size, color, shape, and theme. If a specific arch is required but unavailable, we will roam the forests until we find it. The end result is a one of kind personalized home for your one of a kind canine companion that also complements the surrounding decor. Home suite home for the modern dog! What Is Your Customization Process For The Feline Fine Art Mountains? Just like with our Dog Caves, we will work with you to create a Feline Fine Art Mountain, which suits your feline friends preferences. We offer a variety of mountain heights, access ramps to various points on the mountain, resting plateaus, lairs, scratching surfaces, anti-slip surfaces, toy caverns, feeding areas etc. If you have a theme in mind, we can certainly work towards incorporating it into the piece. 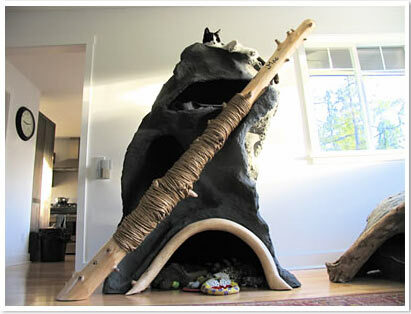 When it comes to creating a mountain for your beloved feline, the sky's the limit! What Do Our Customer’s Say About Scotties’s Fine Art Caves? Want to know how I converted my outdoor barn cat in the wilderness of southern British Columbia to a, content, indoor cat? SFAC Inc. Thank you Artisans Richard, Scottie, and iMac for allowing us to so easily, and naturally, bridge the gap. Now the proud owner/sole occupant of, SAGUARO ROCK, Nicholas has taken complete ownership of his personalized indoor cave dwelling, and no longer is perpetually preoccupied with going out of doors. Situated in the sunniest room within our home with a panoramic view of the living forest that completely engulfs us, he is now able to safely observe the abundance of wildlife, predators included, rather than succumbing to it as a tasty morsel. It brings us so much joy just to watch our four cats journey up and down their mountain. Observing them sleeping, nestled, snug and warm inside their bolstered, private little abodes is a daily treat in itself. The mountain not only changed the look and feel of our living room, it created a new perspective into the world of cats. We were surprised to learn how a simple investment into large hunk of paper mache could elevate the esteem and pride of these beautiful creatures, too often deemed just 'house cats'. Well done Scottie's Fine Art Caves! "Give me five" from Basil, Ozzie, Smudge & Patches!